Do you own or run a local business? Or do you need a hand in starting your own venture, attracting new customers or expanding? If so, come to H&F Means Business. The annual business support event, organised by H&F Council, returns to Hammersmith Town Hall on Wednesday (3 April) from 9am to 5pm. The free event has helped hundreds of local traders – including Horton and Garton – take their business to the next level with expert one-on-one advice, networking opportunities, seminars and support from local suppliers. Book an appointment for personal advice from an expert on accounting, law, marketing, sales, business development, funding and much more. 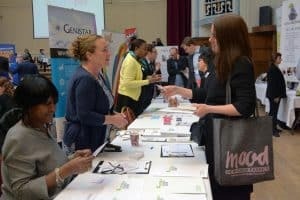 The event sees hundreds of local business owners, managers, start-ups and entrepreneurs together at the sixth Hammersmith & Fulham Means Business. During the day, you can attend seminars, participate in speed and open networking, get free and professional 1:1 advice and go around the exhibition. This event is part of the council’s Industrial Strategy to bring economic growth to everyone in the borough. H&F Council wants the borough to be the best place in Europe to work, live and socialise. Free business seminars will be held on a variety of topics, ranging from finance to social media and marketing to business growth. Covering a wide range of subjects, our 1:1 advisers are on hand to guide and help you through business situations you may not have experience in. With two speed-networking sessions and informal networking across the day, there will be plenty of opportunities to meet your next client, supplier, partner or friend. Speed networking allows you to meet a lot of people in a quickfire and fun way – make sure that you have your elevator pitch sorted and that you have plenty of business cards. –Support Groups – Advice, guidance, protection and more.